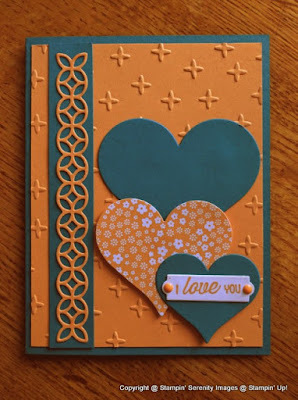 Welcome to the Crazy Crafters Blog Hop with our Special Guest stamper, the very talented Jennifer Michalski - we are thrilled to have her join us this month and so excited to CASE (Copy And Selectively Edit) any project that has been created by her. We hope you find great inspiration from the projects. This is Jennifer's card that I have chosen to CASE. I like the colour combination of Dapper Denim and Peekaboo Peach and also the simplicity of the design. To see more details about Jennifer's card, click on the image to link to her blog. For my card, I kept the colour combination and the basic layout design. This is my CASE of Jennifer's card. Dapper Denim and Peekaboo Peach make good companions for each other! 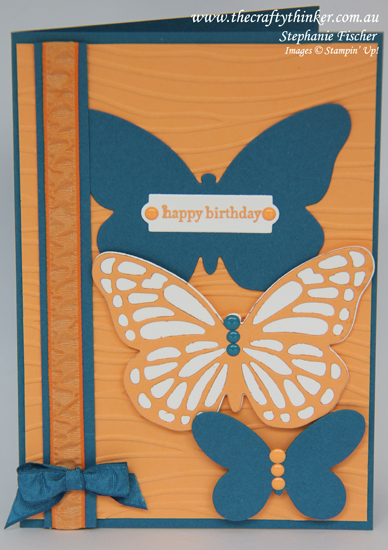 I exchanged butterflies for hearts, changed to the Seaside embossing folder and used Ruched Ribbon rather than a die cut. The top butterfly is adhered flat to the card front, the middle butterfly is popped up on a layer of dimensionals and the lower butterfly has a double layer of dimensionals. The greeting is from Teeny Tiny Sentiments stamped in Peekaboo Peach on Whisper White cardstock that has been cut with one of the dies from Bunch of Banners.